In this Autumn-Winter of 2017-2018, regularly I am using Cosme Decorte AQ Emulsion ER. In AQ line, they are going to add “Whitening” for SS2018, we have already stopped dealing AQMW Repair White line, but still they are dealing. If you want to have them, please ask us. Anyway, I got small bottles of AQ Whitening Emulsion & Lotion. Please let me share with how I felt with comparing with some other products. 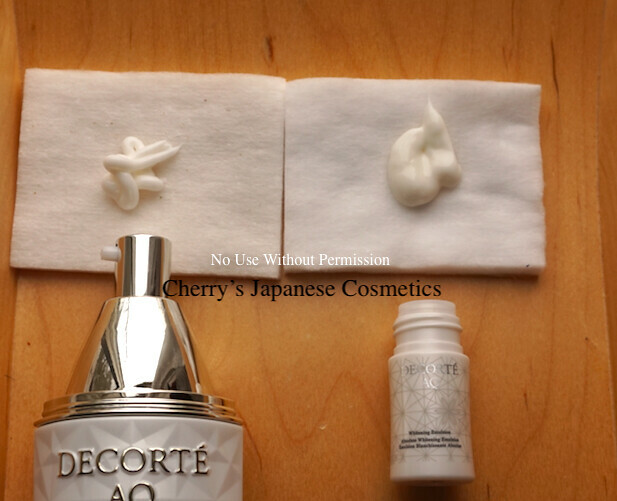 In this Cosme Decorte AQ Whitening Emulsion, there are no ER or something, there is only one type of emulsion. The “Whitening” means brightening, and the brightening factor is by Kojic Acid. As of Feb 2018, I am almost done with AQ Emulsion ER. Fortunately I could left enough with comparison! Two pushes for AQ Emulsion ER, and almost the same quantity of AQ Whitening Emulsion. It is under the chilly weather of Feb, there were no snow, but I saw snow on the ground yesterday, I did not feel both textures are so much runny under this climate. Taking the cotton, and applying on my half of my faces, I felt the Whitening Emulsion is a little bit runnier / softer than Emulsion ER. I often feel something strange (mainly sting) with using the products including Kojic Acid. And I also am not a big fun of the smell of Kojic Acid what is better than artificial floral scent. It is true that I used the strong perfumed AQ Emulsions , it was really hard to find the difference of the smell, and I could not find the scent of kojic acid. I often feel anything irritation by this AQ Whitening Emulsion. But if you are hesitate to use the products with strong scent of flower, both are not for you. I am feeling my skin afterward of these emulsions, I felt Whitening side is smoother and lighter than Emulsion ER side. Indeed I never say this Whitening Emulsion is less oily. 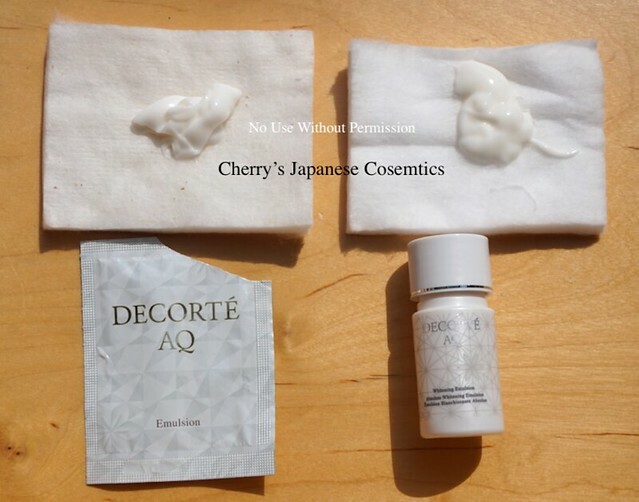 Both are oily products, if you are an oil prone, Cosme Decorte is the last brands I recommend to you. All of the package of AQ Emulsion, and (it is the final review, actually as the order of my reviews) all the left of the AQ Whitening Emulsion. 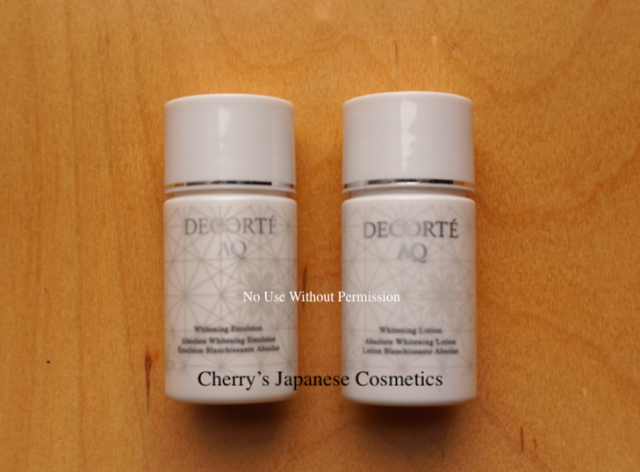 My face was super dry with using the stronger face wash, and both AQ Emulsion and Whitening Emulsion helped my skin moisturised again. Both are oilier products, and I felt they are almost the same level of smoothness and lightness. I felt AQ Emulsion ER was much richer than AW Whitening Emulsion. I had thought I should better to compare with Albion Excia AL Whitening Rich Milk SV first, due to the quantity of the Emulsion left on the small bottle. This decision was a good solution. Yes, Whitening Rich Milk is richer than AQ Whitening Emulsion. Afterward of my using, I felt the AQ Whitening Emulsion side is smoother and lighter. I felt if you are a person who feel Excia AL Whitening Rich Milk SV is too rich, I guess this AQ Whitening Emulsion is worth a try. I say again, even I felt this AQ Whitening Emulsion is lighter than Excia AL Whitening Rich Milk SV, Cosme Decorte is a brand with oil. If you are an oil prone, this is not for you, I know. Infinesse White Whitening Pump is also for SS2018. AQ Whitening Emulsion is runnier than Infinesse White. 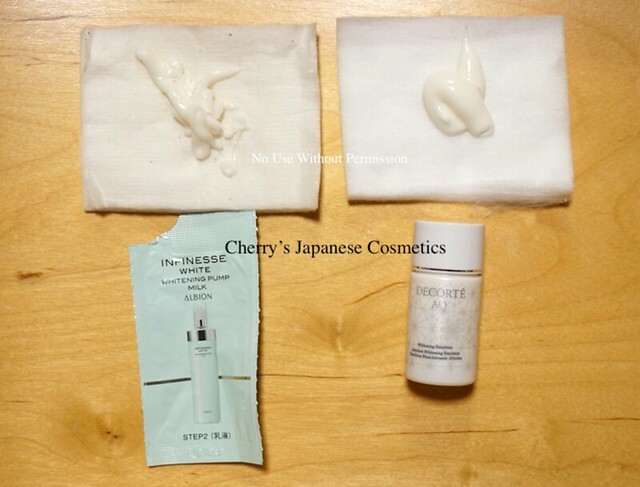 Both are smooth and lighter texture on my face, afterward of my using. I thought you can choose the price and perfume. For me, the affordable price is Infinesse White, and the scent is AQ Whitening. Please see also my other review for Albion Infinesse White Whitening Pump Milk. Please check the latest price, and order from here: “Cosme Decorte AQ Whitening Emulsion” or in our JPY Branch!